Colony collapse disorder (CCD) is the phenomenon that occurs when the majority of worker bees in a colony disappear and leave behind a queen, plenty of food and a few nurse bees to care for the remaining immature bees and the queen. While such disappearances have occurred throughout the history of apiculture, and were known by various names (disappearing disease, spring dwindle, May disease, autumn collapse, and fall dwindle disease). 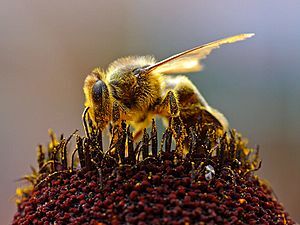 The syndrome was renamed colony collapse disorder in late 2006 in conjunction with a drastic rise in the number of disappearances of western honey bee (Apis mellifera) colonies in North America. 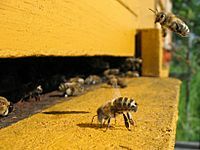 European beekeepers observed similar phenomena in Belgium, France, the Netherlands, Greece, Italy, Portugal, and Spain, Switzerland and Germany, albeit to a lesser degree, and the Northern Ireland Assembly received reports of a decline greater than 50%. Colony collapse disorder causes significant economic losses because many agricultural crops (although no staple foods) worldwide are pollinated by western honey bees. According to the Agriculture and Consumer Protection Department of the Food and Agriculture Organization of the United Nations, the worth of global crops with honey bee pollination was estimated at close to $200 billion in 2005. Shortages of bees in the US have increased the cost to farmers renting them for pollination services by up to 20%. Studies in Europe and North America have shown dramatic declines in bee colonies. The U.S. has lost 59% of its bee colonies since 1947, and Europe has lost over 25% since 1985. Determining the causes of bee colony collapse is crucial to the global economy, as bee pollination assists with 9.5% of the global agricultural production worth billions of dollars. Through ecological modeling and retrospective studies, research has shown a link between bee colony collapse and climate change. Although the shifting weather conditions themselves negatively affect bees, the link between colony collapse and climate change is also closely tied to the interaction between bees’ climatic niches and food-plant reductions. Climate change affects the floral environment by stunting flower development and nectar production, which in turn directly impacts colonies’ abilities to collect pollen and sustain themselves. Presence of capped brood in abandoned colonies. Colony members are reluctant to consume provided feed, such as sugar syrup and protein supplement. Researchers are concerned that trucking colonies around the country to pollinate crops, where they intermingle with other bees from all over, helps spread viruses and mites among colonies. Additionally, such continuous movement and re-settlement is considered by some a strain and disruption for the entire hive. Honey bees are not native to the Americas, therefore their necessity as pollinators in the U.S. and other regions in the Western Hemisphere is limited to strictly agricultural/ornamental uses. The phenomenon is particularly important for crops such as almond growing in California, where honey bees are the predominant pollinator and the crop value in 2011 was $3.6 billion. In 2000, the total U.S. crop value that was wholly dependent on honey bee pollination was estimated to exceed $15 billion. Because of such high demand in pollinators, the cost of renting honey bees has increased significantly, and California's almond industry rents approximately 1.6 million honey bee colonies during the spring to pollinate their crop. Worldwide, honeybees yield roughly $200 billion in pollination services. 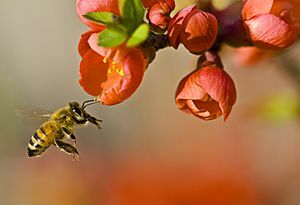 They are responsible for pollination of approximately one third of the United States' crop species, including such species as almonds, peaches, apples, pears, cherries, raspberries, blackberries, cranberries, watermelons, cantaloupes, cucumbers, and strawberries. Honeybees perform some level of pollination of nearly 75% of all plant species directly used for human food worldwide. 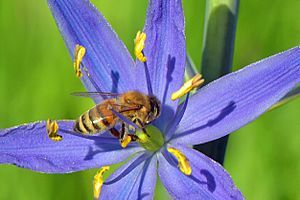 Catastrophic loss of honeybees could have significant impact, therefore; it is estimated that seven out of the 60 major agricultural crops in North American economy would be lost, and this is only for one region of the world. Colony collapse disorder Facts for Kids. Kiddle Encyclopedia.